What’s the latest diet craze? For Russians, where many imported foods have just been banned from shelves, learning to cook like a Soviet may be more of a necessity than a choice. Luckily RBTH has you covered. Discover our latest special project – The Soviet Diet Cookbook. 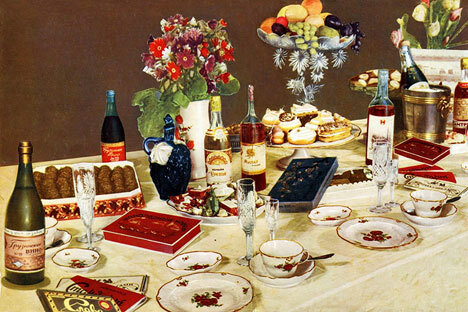 Each Friday for the next year, cook and food writer Anna Kharzeeva will give you a complete menu prepared from the pages of the Book of Healthy and Tasty Food – the go-to guide for every Soviet housewife. I am about to embark on an amazing culinary journey. For the next year, I will be cooking my way through “The Book of Healthy and Tasty Food” – an iconic Soviet cookbook that was the ‘go-to’ book for just about every Soviet family. The book features more than 1,000 recipes and includes not only classic Russian dishes, but also Uzbek, Georgian and Ukrainian meals – it was a book for the entire Soviet Union, after all! In addition to recipes for every occasion, the book has advice on how to eat well, recommendations for setting a perfect table, choosing the best wine for your food and organizing your time. It’s a fascinating read for someone who was born in the Soviet Union, albeit only five years before it ceased to exist. All my life I heard about the Book of Healthy and Tasty Food from my mother and grandmother, but never looked into it with the attention it deserves. My grandmother, however, paid a lot of attention to this book. It was the foundation for her cooking, although I learned this only recently. Her table always involved a lot of soups – ones where ingredients are put in fresh, not fried as many Russians do – porridges, baked pies (pirozhki) and vegetables, with the occasional serving of fried potatoes and sour cream. And there was always dill and parsley on the table. Dessert was sponge cake with apples or cherries. Growing up, I never noticed that dessert was always the same – my Australian husband had to point it out to me! Although I grew up eating my grandmother’s food, as I got older, I wanted to explore different kinds of cuisine. I first fell in love with Italian food (I think all Russians do). Then, going to Australia opened up a whole new world of cuisines to me and I came to love all these unusual, enticing and sometimes spicy foods. For a long time, I was so struck by the exotic beauty of these cuisines that I had no interest in Russian food. But eventually I came back to my roots, and rediscovered Russian cuisine as a “seasoned” eater (I swear, no pun intended!). In this process, I realized that the Russian food I ate at my grandmother’s table was different than the Russian food I had elsewhere – it was lighter, fresher, not greasy. I now think this is probably because she actually followed the recommendations in the Book of Healthy and Tasty Food very closely and made her dishes in a diet-conscious way. This is also the approach I will take as I cook my way through this book. Each week of the month, I’ll plan and cook a Soviet-approved meal – one week, breakfast, then lunch, then dinner. The fourth week of each month, I’ll try something more time consuming – like making jam or pickles. After I make each meal, I’ll get my grandmother to comment – not just on my cooking skills (in fact I truly hope she refrains from that! ), but about how she cooked these dishes 50 years ago when she was my age. I must also say that I am not a professional chef, although people often confuse me for one because I run a cooking school. I always reply that running a school involves getting other people to cook for me, which is better than actually cooking myself. But I do love to cook, and this project will very much be about an ordinary 28-year-old Russian girl rediscovering her country’s cuisine with the help of her grandmother with all its trials and errors it might bring - and hopefully some successes too! I will be channeling Julie Powell and the Julie & Julia project – thank you for the inspiration. I’m so excited that unlike all those other people who post food photos on Instagram and updates on Twitter, I’ll actually have a reason to tell the world what I’ve had for breakfast, lunch and dinner! I hope that you will be excited, too. Join me as I go on the Soviet diet.